From the library you get to the kitchen through a hallway that houses the coffee/drink bar. 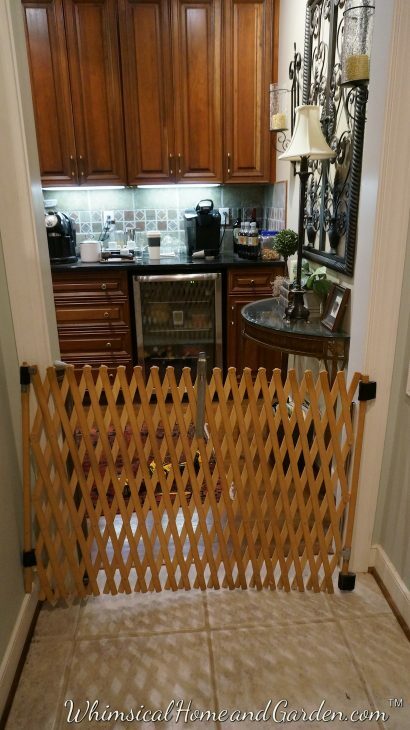 For years I have suffered using a baby gate. I have no baby, so why a baby gate? 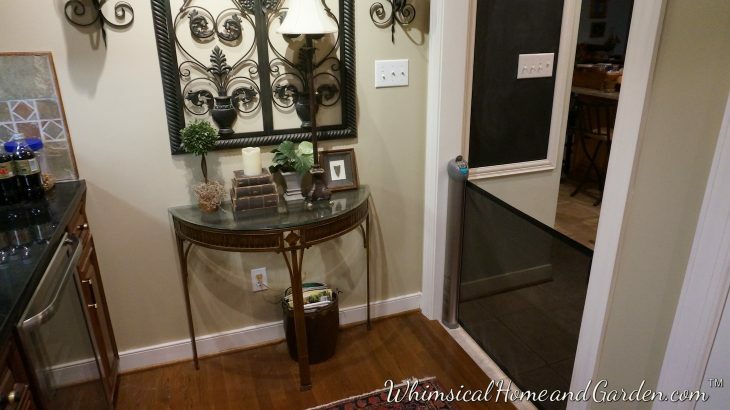 Well, there were many occasions, such as vacuuming, or company or opening and closing the front door, that I wanted or needed to keep the dogs safely confined to the great room. That blasted gate was a royal pain in the buttskie. Whitley and Carter were very respectful of it, never knocked it over or jumped on it, and they were pretty reliable not to cross into the front part of the house by command alone. But I could not risk them getting out the front door accidentally because they both have strong prey drive and they would have been off and running. Even though half of the 7 acres is fenced, I needed that security of an inside gate. I never mounted it permanently because #1, it’s ugly, and #2, why put screw holes in the door trim if you don’t like the gate? I kept saying to myself I would build one, but the door opening is 37 inches wide and a dutch door or something like it would get in the way. So what could I do? Well, the problem was solved by another baby gate that doesn’t act like a baby gate. I love this darn thing. On the very far right you can see the baby gate. Not very attractive considering the space. Pretty ugly! 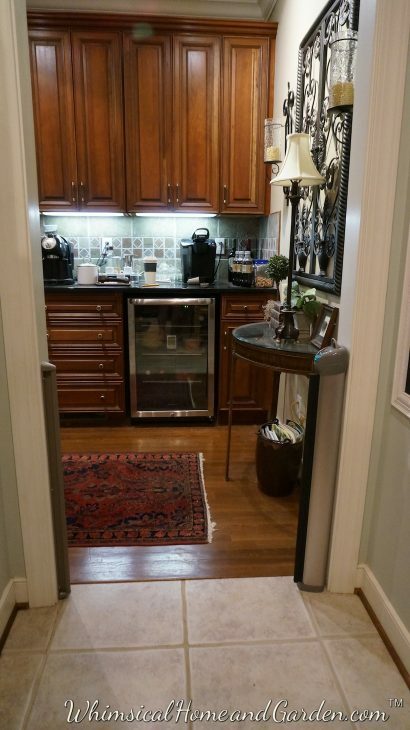 This is looking in the opposite direction….towards the coffee bar, and then left to library and dining room. You can see the velcro I put over the metal hanger part. They would scratch the walls. Before that I was always having to use magic eraser. It was just problematic all around. I keep a small stool on the right for odds and ends, and to also hold the gate tight against the door opening. The solution. 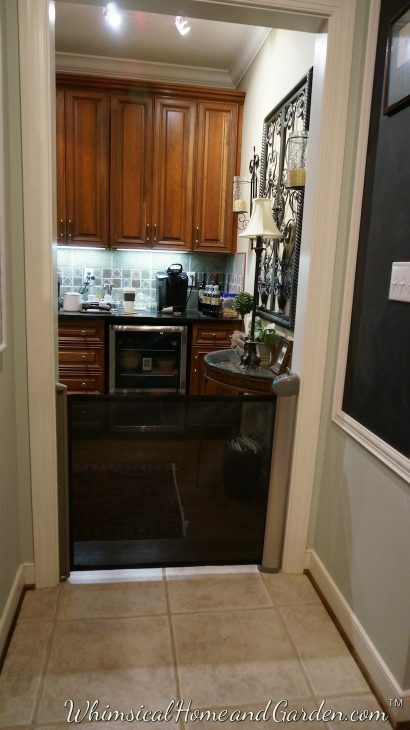 Another baby/pet gate, but of an entirely different sort. Safe, easy to use, and disappears when not in use. It also locks so it cannot come undone and snap back suddenly. Here it is closed, rolled back into the column mounted on the right in the opening. The lock is at the top. It is called the Summer Retractable Baby Gate. You can google it and it is carried by a lot of places. It also comes in a lighter colored version. Here it is across the door opening. It is a quite heavy mesh capable of avoiding damage by dogs or babies. It is 30 inches high, and fits openings to 50 inches. Here is what it looks like approaching it from the dining room. Same view. It is easy to open and close as well. I have several pocket door in this house, and I should have placed a half door one in this opening, but this acts much like a similar “now you see it, now you don’t” solution. It has been in use for a while now, and looks as good today as when we put it in. 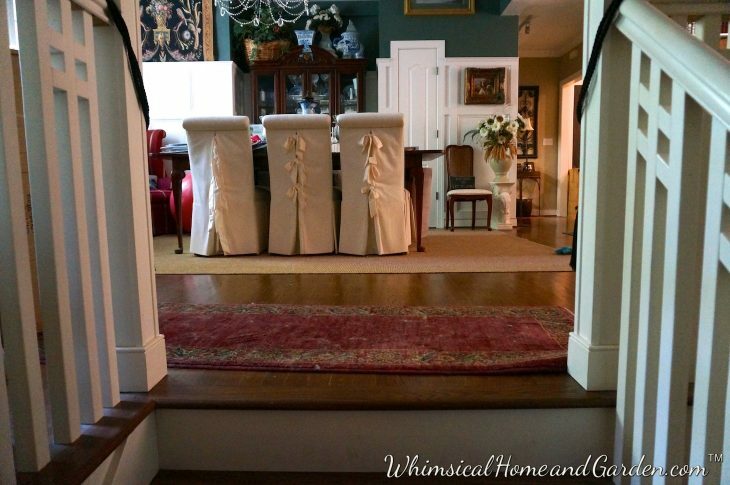 Installation was simple and straightforward. 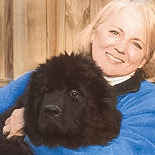 Even with the 154 lb Newfie added to the family, it still seems to be handling it’s job very well. I can’t believe I put up with such an ugly gate for years. I had no idea these existed. 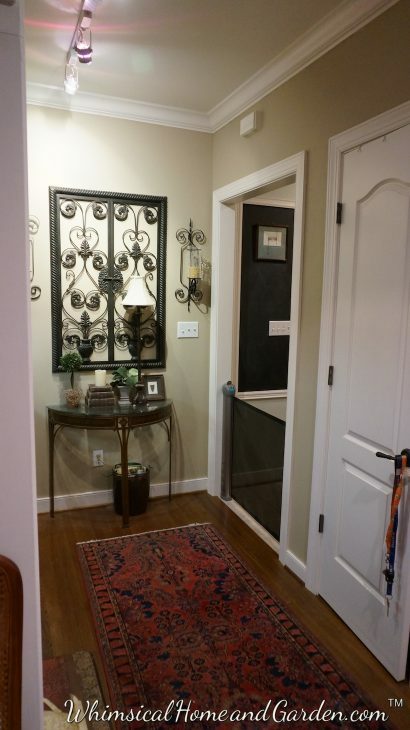 All the dog gates I looked at were cumbersome, or ugly, and expensive and didn’t really solve my dilemma. So there you have it. A quick solution. Awesome idea–Ill get for my daughters home.. for baby And doggies! Thank you sooo much! Glad that you might be able to use it as well. It has worked really well for us. I still can’t believe I put up with that other gate for so long! We also enjoyed warmer weather yesterday. The snow was beautiful but our water feature was frozen for days and days! It is 70 degrees here today. Wild ride on the winter weather train.Hope that your water feature thaws soon and without any damage.